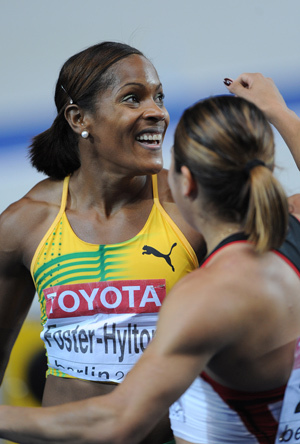 Brigitte Foster-Hylton of Jamaica won women's 100 meters hurdles at the ongoing 12th World Athletics Championships on Wednesday. The 34-year-old veteran, who won world bronze in Helsinki in 2005 and silver in Paris in 2003, took the gold medal at the Berlin Olympic Stadium with 12.51 seconds, this season's best mark for her. Canada's Priscilla Lopes-Schliep, bronze medalist at the 2008 Beijing Olympics, won silver with 12.54. 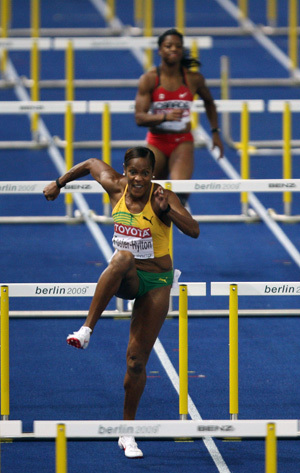 The bronze medal went to Jamaica's Delloreen Ennis-London, who also won medals at the 2005 and 2007 world championships. She finished the race with a mark of 12.55. "I am overjoyed. I still cannot believe that I am the world champion," Foster-Hylton, the gold medalist, told reporters after the race. "I have waited many years for this title. It has been five years since Paris, since I found myself in gold medal shape," she added. In the meanwhile, Lopes-Schliep expressed her satisfaction with the silver medal. "I knew that I had it in me but it was a matter of pulling things together and execute the race well," she said. Ennis-London, who had been fighting with injuries, also said she was happy with the result. "This is my third big medal from the world championships but this one is special. It means much more to me because I was battling with the injuries," she told reporters.